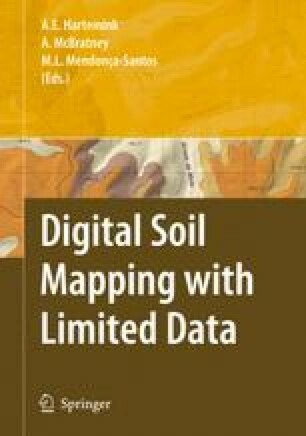 Little effort has been made to link soil mapping and soil data density to a nation’s welfare. Soil map density in 31 European countries and 44 low and middle income countries is linked to Gross Domestic Product (GDP) per capita and the number of soil scientists per country. National coverage of exploratory soil maps (>1:250 000) is generally higher in the poorest countries and decreases with increasing GDP per capita, whereas the national coverage of detailed soil maps (<1:50 000) tends to increase with increasing GDP. GDP is larger in countries with more soil scientists per unit area, likewise, the number of soil scientists increases with increasing GDP. More soil scientists per ha of agricultural land was found to be related to higher crop yields. Obviously, there are many confounding and interacting factors but this analysis illustrates how proxies for soil map density can be used; it is suggested that appropriate indicators should also be developed for spatial data infrastructures and digital soil maps to demonstrate their effectiveness for society and human welfare.